UPDATE: Verizon let the dogs out and published the video, we are embedding below. Verizon managed to upload on YouTube and then turn private a "Tablets Powered by Verizon" video showcasing the wonders of a mystery Honeycomb tablet. It could be an upcoming Motorola XOOM 2 with quad-core NVIDIA Kal-El chipset, but there was no Motorola logo at the front. Or it could be a Verizon-bound 10" HTC Puccini, although that's pretty far-fetched, since we've only heard it is destined for AT&T's LTE frequencies for now. Ok, we are running out of plausible versions here. Alternatively, this could just be a placeholder tablet meant to play a role in a Verizon promotional video, since the YouTube video initial screen says "Screen images simulated". 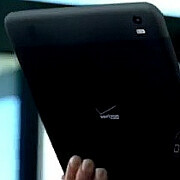 Anyway, if Verizon is prepping new Honeycomb LTE tablets, it shouldn't be long before more is leaked on the Internets. Do you think they paid DC comics the right to use Kal-El? GET THE LAWYERS READY! Yep.. Looks like some sort of xoom to me.